On Monday, October 10th, after a brief rally hundreds of people are expected to join a march across one of the busiest intersections in the state en route to a major public Vermont Gubernatorial Debate at the DoubleTree Inn in South Burlington. In front of the hotel prior to the start of the debate, a broad coalition of organizations will call for bold action to protect the environment and improve communities under a “Clean and Green New Deal” for Vermont as well as stand in solidarity with the struggle of indigenous people of the Dakotas currently protecting native lands. “The Standing Rock struggle is not just a struggle for indigenous people’s rights, but it’s a struggle for all people to have clean water and a healthy environment,” says Beverly Little Thunder, one of the event organizers who is a member of the Lakota Standing Rock tribe and chair of the Peace & Justice Center board. “We believe it is a critical opportunity to press Vermont’s political establishment to take bold action to protect our environment, to ban new fossil fuel infrastructure, establish meaningful reforms for energy democracy and invest in clean water and renewable energy,” says Laura Mistretta, a leader of Rights & Democracy, one of the organizations coordinating this event and a new effort calling for a “Clean and Green New Deal for Vermont. What: On Indigenous People’s Day (formerly Columbus Day) a rally in solidarity with Standing Rock struggle against the Dakota Access Pipeline will be held at the University of Vermont. Where: Rally begins outside upper entrance of Davis Center, University of Vermont in Burlington. Then marches to Double Tree Hotel in South Burlington. 350Vermont: 350Vermont is a statewide organization in Vermont working to build a grassroots movement to reverse climate change. 350Vermont’s mission is to catalyze the cultural and systemic transformation needed to reverse climate change and return to 350 ppm of carbon in the atmosphere. Although we are an affiliated group of 350.org with a similar mission, 350VT is an independent organization, with local campaigns to divest the state pension fund, advocate for a carbon pollution tax, and stop any expansion of fossil fuel infrastructure. Rights & Democracy (RAD): is a grassroots membership organization in Vermont and New Hampshire. RAD launched a year ago to build the political revolution on a local level to impact elections and move forward issues like a $15/hour minimum wage, universal healthcare, and environmental justice. Vermont Chapter of Sierra Club: The Vermont Chapter of the Sierra Club is a volunteer-led affiliate of the national Sierra Club. 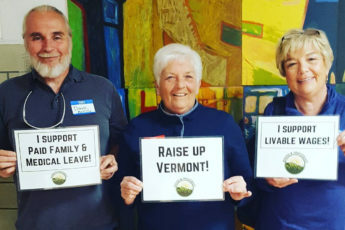 The Sierra Club is America’s largest and most influential grassroots environmental organization, with more than 2.1 million members and supporters nationwide and 9,000-plus members and supporters in Vermont. The Sierra Club works to safeguard the health of our communities, protect wildlife, and preserve our remaining wild places through grassroots activism, public education, lobbying, and litigation. Lake Champlain International: Lake Champlain International (LCI) is a federally recognized 501(c)(3) non-profit organization actively involved in shaping the future of Lake Champlain’s water and fisheries health for the well-being of the people who depend on it today and tomorrow. To protect, restore, and revitalize Lake Champlain and its communities, LCI educates, advocates, and motivates to ensure that Lake Champlain is swimmable, drinkable, and fishable, understanding that healthy water resources are essential for a healthy economy and a healthy community. Peace and Justice Center: The Peace & Justice Center is a Vermont-based non-profit, membership organization with the mission to create a just and peaceful world. To this end, they work on the interconnected issues of economic and racial justice, peace, and human rights through education, advocacy, training, non-violent activism and community organizing.